Alumnus and award-winning novelist, Siddharth Chowdhury, pictured on campus with his latest book, The Patna Manual of Style. 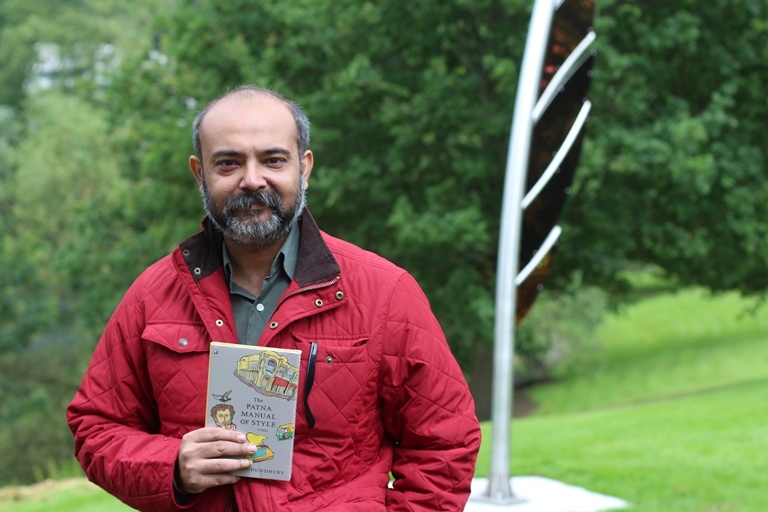 An award-winning Indian writer who came to Stirling on a creative writing fellowship in 2006 returned to campus today – to revisit the inspiring surroundings that helped him write his 2009 Man Asian Literary Prize-shortlisted novel. Delhi-based writer, Siddharth Chowdhury, wrote much of his critically-acclaimed novel Day Scholar during his time at Stirling, when he sought creative inspiration from the 330-acre campus and maintained a writing schedule of 300-500 words per day. Siddharth’s professional accomplishments were recognised recently when he was awarded the prestigious Professional Achievement Award at the British Council’s First Education UK Alumni Awards. Returning to Stirling for the day, Siddharth had a tour of campus and met with key University staff, including academics in the Division of Literature and Languages, and Professor Gerry McCormac, University Principal and Vice-Chancellor. Siddharth said: “It’s been a privilege and a pleasure to come back and walk down memory lane. I went to my old residence, Polwarth, which was lovely to see again after all these years. Professor Gerry McCormac said: “Siddharth Chowdhury’s talent, hard work and success make him a wonderful role model for our students. We are delighted to welcome him back to the University and honoured to be able to congratulate him in person on his outstanding professional achievements. Siddharth received Stirling’s Charles Wallace Fellowship in Creative Writing 2006-2007. Funded by the Charles Wallace India Trust, the Fellowship provides Indian writers with the chance to come to the UK and spend time at Stirling, devoting themselves to their own writing and contributing to the life of the School of Arts and Humanities and the Centre of Postcolonial Studies. Find out about the Charles Wallace Fellowship. Siddharth is a professional editor and is currently translating Eliot Wenberger’s poem ‘The Stars’ into Hindi for the Museum of Modern Art, New York. His most recent novel, The Patna Manual of Style was published in February 2015.